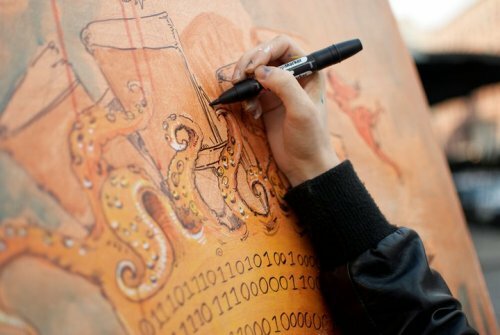 SURPRISE: Free Vampire Squid Sketches @ Occupy Wall Street! Dear comrades, today I’ll be doing FREE sketches at Liberty Park in support of Occupy Wall Street. Come by and get your signed drawing of a top-hatted cephalopod representing the banking class. This entry was posted in Events on October 2, 2011 by Molly. Your offer of free squid sketches (wish I had been there I would have come by for one) made USA Today but the reporter didn’t know what to make of it. “Drone Attacks Foment Terrorism” (an apparent reference to the death of al-Qaeda leader Anwar al-Awlaki), “Obama: Stop Funding Israeli Occupation” (supporting a Palestinian state) and “Free Squid Sketches” (unclear). Love the design of your website. Great stuff. Ha! I probably should have had a better (or clearer) sign. Point to note if I do it again!